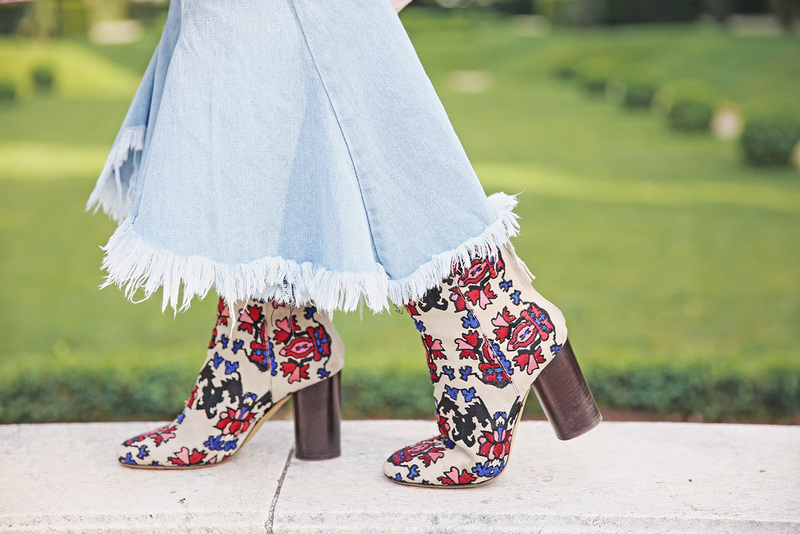 Looking a little retro in my flared pants and floral boots. I love that we live in a time like ours–where we’re not stuck to one style of dressing and instead, get to borrow from the fashion trends of the past and mix them with new ones. It makes fashion nowadays so much more exciting and dynamic, don’t you think? But then again, it can make our closets a little bit too full as well. What with all the trends that come back around, we can’t seem to throw anything away too hastily now. I mean you’ll never know when something will be in again and all of a sudden, it’s that key piece you can proudly claim to be “vintage”. And that my friend is the wonderful world of fashion–the addictive cycle that never ends. I posted my question in the wrong post :( This is where I’m actually interested what type of lens you’re using? Thanks! I always stick to skinny or straight cut jeans whenever I go shopping because I think flare jeans are hard to pull off. Boy, you proved me wrong! Also, did I mention that flare jeans are usually the leftovers whenever there’s a sale? LOL! Flared pants + booties + Camille Co = <3 <3 <3!!! This pink duster coat is so pretty! I love the way you paired it with such flared jeans – really makes for a statement! <3 :) And yes, fashion is so magical, don't you think? I'm always amazed at how the trends come and go! Thanks Elizabeth!!! :) Love this light coat! Fashion has a way of reviving itself. I never thought I’d see these flared jeans again. They bring me back to my late elementary/early high school days. Haha! You look good as always Cams! I love your boots! It’s cool! so fashionable..you are getting prettier and prettier…i love the coat! Thanks Bev! :) Good thing it’s not the opposite haha!